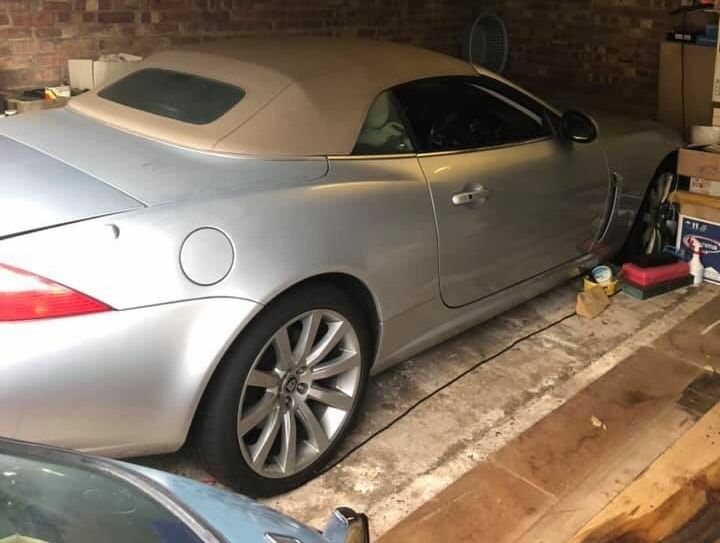 Whist I was bored Monday perusing some Jaguar Facebook pages, a post suddenly appeared entitled For Sale with photos of an XK on an 07 plate tucked away in the corner of a garage alongside a blue V12 E Type. Long story short, I bought it yesterday. Nice little XK in Liquid Silver (code MEE) with a tan top, Ivory interior and a nice Burr Walnut dash for those over 60! The plan is that my pal in Jersey is looking for a low mileage XK for his wife, so it is for him/her. Just needs a bit of my TLC an MoT and a service and she will be good to go. It had new tyres fitted 5 years ago just before the owner became ill since when it hasn't turned a wheel. They had dropped to 20 psi and have developed flat spots so I am hoping that 40 psi for a while should round them off again. Sadly, the owner passed away in November so his collection has been sold. The1973 restored E Type Coupe was in lovely condition with 56k on the clock. Sold for £50,000, or so I was told. Off to do a bit of claying and polishing after giving it a good wash yesterday. Get some pics up when you get a chance, sure such a low mileage example will be great to work with paint wise. 5 year old rubber might be hardened enough to need swapping out. I start getting worried at about this age - I often end up throwing out on age due to low mileage and too many cars on the go. See how they feel if the flats pots come out completely. I would love to see some pictures.....Just been down to my garage and checked all the corners, but sadly found nothing except cobwebs! .... and a nice Burr Walnut dash for those over 60! OI! Some of us just developed taste early! OK guys, regarding those photos. I have given her paintwork a good claying and waxing, and cleaned the interior and the top, so she is looking rather nice. She has CATS suspension - is that an optional extra for an XK? She has loft leather perforated seats which I believe was an extra too. She also has a TM system which I have been getting to grips with. Apparently it was used as a NAV system, which is strange since it has SATNAV, but it can also be used, for a fee of £49pa, as a tracking device. If the car is pinched, the owner could ring up TrafficMaster who would be able to see where the car is. I have fixed the ASL button (my partner, Alison, calls it Alisons Speed Limiter) and ashtray which were both sticky - coffee spill at a guess and cleaned all the dash and windows. button! She (not Alison) is now insured and booked into G and Ds for an MoT and oil and filter change (need a stamp in the book) on Monday, after which I can tax her and drive around legally and find a nice setting for some photos. Oh yes, I'll pump the tyres up to 45psi too to try and sort out the flatspots. Nothing tried, nothing gained! The paintwork is in amazing condition, there is hardly a mark on it and to me, all the paintwork looks original. There are a couple of very small scuffs on the nearside front wheel which I will sort out soon. Well that kept me out of mischief for a couple of days. Here is a shot the seller took after the blue E Type was almost pushed out of shot. That looks good. Tan tops can look a bit sometimes IMHO but it works there. Have you tried it (the roof) yet? Be careful with the alloys. I have the same design and despite being quite sure I hadn't clipped any kerbs, they're damaged. She has CATS suspension - is that an optional extra for an XK? She has loft leather perforated seats which I believe was an extra too. She also has a TM system which I have been getting to grips with. Apparently it was used as a NAV system, which is strange since it has SATNAV, but it can also be used, for a fee of £49pa, as a tracking device. If the car is pinched, the owner could ring up TrafficMaster who would be able to see where the car is. Nice work! Looks very tidy, good find. CATS I gather was technically an option but I've never actually seen a car without it, even the very early ones. Perforated seat faces usually indicate the presence of the optional cooling feature for the seats but I didn't think cars that early had that option - could be wrong. Trafficmaster, I remember that - I had a SEAT that had it fitted, it worked when I bought the car but stopped soon after, presumably when the subscription ran out. That was a good afternoon's work removing large chunks of the dash and interior trim to rip all that stuff out. If the new owner of this is in Jersey then it won't take long to find it if it gets half-inched!